Love wooden eggs, and this is a great idea! Just perfect. I've missed you! I'm so glad to see your latest post. I've been a fan for a long time but just recently became an official follower. I'm a shy blogger. thanks for the lovely place card holder suggestion. What a sweet idea. It would be the sweetest little keepsake for a mother to keep. And a mother of four with four wooden eggs to place in a bowl or basket as a centerpiece-such a unique way to remember one's precious children! 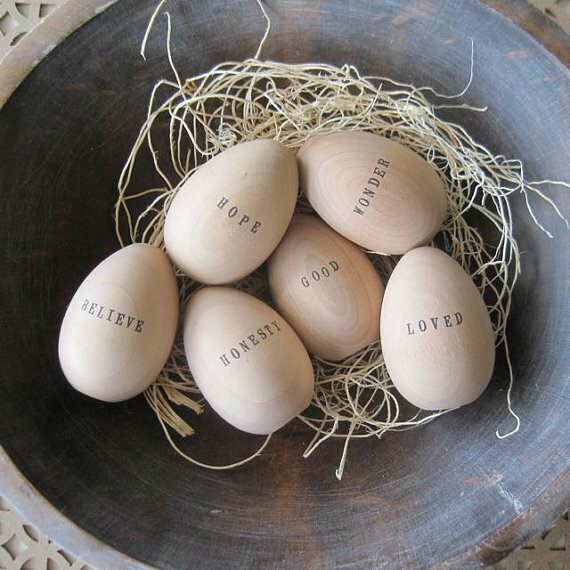 What a cute idea...love wooden eggs. Thanks for the idea. This is a great little gift idea and for a baby gift...even better. I love these little wooden treasures... They could be the perfect thing for so many occasions... Eggs have such symbolism... Sweet post. Have a great Easter. Oh, these are darling, Sande! Won't let me sign it, though! I love this idea! Wonderful!! And I love the earthy colors with the black lettering. I hope your Easter is wonderful!